We will never get flying cars, at least in the form that every sci-fi movie suggests. Giving everyone a tiny plane is a regulatory and safety nightmare, so until we’re all connected to an automated driving grid, we have to rely on Back to the Future: Part II for the second-hand experience. BHunter, an action game by InterActive Vision, nails that fantasy to the exclusion of everything else attractive about a future setting. 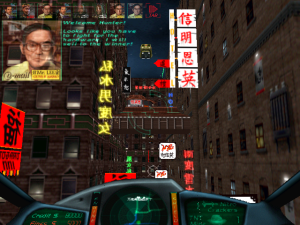 BHunter‘s hovercar handles so well that it props up almost the whole game – except for its scattered narrative. The game wants the background of a dark city where no authority can be trusted without figuring out what role you play in that society. BHunter‘s future is, like many, vaguely dystopian. In 2098, a massive city teeters on the edge of total chaos as criminals, mobsters, and arms dealers run rampant over the authorities. The police have turned to the BHunters, a loose federation of bounty hunters, to keep the city under control. As a BHunter, you take missions from any interested party hoping to bring order to their neighborhood, whatever their definition of order might be. The city embodies every cyberpunk trope. Giant LED billboards line the streets, and sprawling industrial sites on the outskirts keep the glitzier downtown running. If you look to the skies, huge capital ships loom overhead. The game owes an obvious debt to Blade Runner and invokes its visually striking run-down future aesthetics to great effect, especially in how artfully it uses low-resolution textures and models. (The downtown and financial regions of the city, with their beat-up, lit-up skyscrapers and mossy tunnels, looks particularly great.) But it strips those visuals of their meaning. A futuristic mall in the same city as a Kowloon Walled City-esque shantytown should raise questions about social inequality (as in the best cyberpunk works), but here, it just looks cool. Still, cool might be enough. BHunter instead focuses on the joy of traversing that sort of world, and it really delivers. 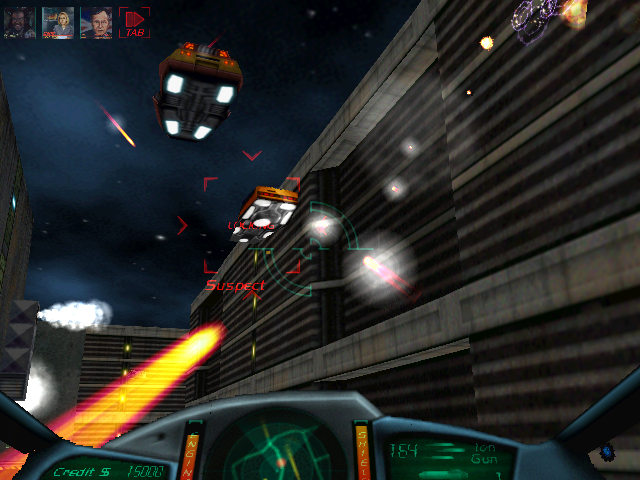 The game’s success rests with your BHunter craft, armed with guns, missiles, and a bottomless fuel supply. Piloting the car captures the awe promised by countless similar vehicles in film. As you swoop through the streets, the game will subtly level your heading, keeping you on-course and allowing you to drive more like a regular car. 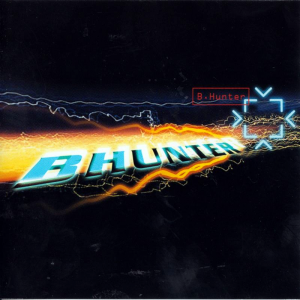 Whipping around a corner at full speed in pursuit of a suspect is an absolute rush, and BHunter gets the feel so right. All of the game’s strengths build off this base. In fairness, the controls seem slippery at first. BHunter nears unplayability when using a mouse or keyboard rather than a gamepad, and of the game’s three difficulty levels (with escalating speed and looseness), only the easiest, slowest car feels manageable. (It’s uncertain who is supposed to be able to play on the hardest setting.) Combat is often frustratingly inaccurate for these reasons, especially given other cars’ nimbleness and tendency to U-turn on a dime. This does match the accuracy of an action movie shootout but becomes less endearing the third or fourth time your expensive, uncommon homing missiles or similar weapons spiral in the wrong direction. Once you get a handle on your car, the game’s pleasures and texture naturally reveal themselves. BHunter has a loose open-ended structure pushed along by bounties you receive. As you trek from one zone to another along the dim City Ring highway system, you notice the little details that bring the world alive. 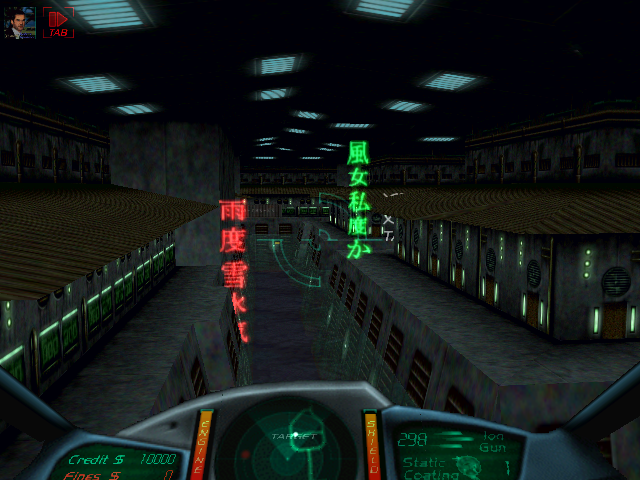 Each area of the city has a similar structure – hall-like streets with side tunnels – but a distinguishing flavor. 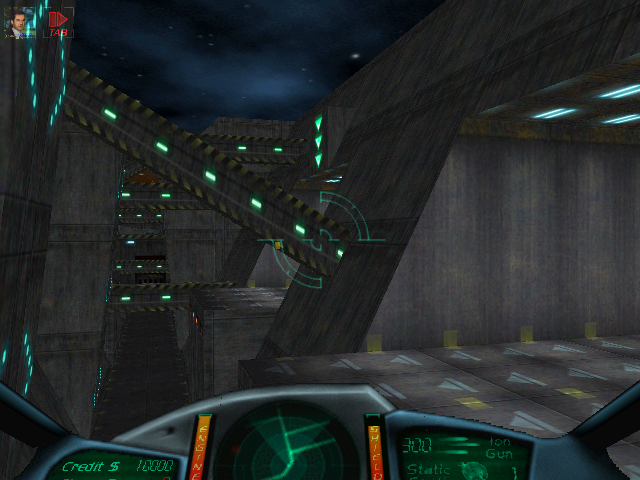 The geometric girders at the Space Port have such different sightlines than the Industrial Complex’s tight passageways or the low-rise warehouses at The Docks. Random cars flying through these boroughs may be tagged as suspects, and other police or BHunters will pursue them and end up in their own firefights that cause collateral damage. You can join in if you want a share of the reward money. The police will fine you if you kill an innocent bystander, like a pizza delivery truck, and at some point you need to swing by the bail office to pay your dues. These little touches give the city a character and an ecosystem beyond its generic cyberpunk roots. The world isn’t defined nearly enough, though. As BHunter progresses, its story tries to gin up intrigue between the forces fighting for control of the city, and it wrecks the loosely established dynamics that hold the setting together. Your missions usually come from police and ask you to track down criminals, which is appropriate for a bounty hunter trying to maintain law and order. Soon, however, you receive an assignment from Mr. Luciano, a mob boss who controls much of the city and runs the Grand Vegas casino district; he also wants you to wipe out criminals, still something befitting a BHunter. But then he asks you to kill police and fellow BHunters to allow him to continue his criminal exploits. This sets up a provocative conflict of interest between your job and your principles. You’re a gun for hire, so are you willing to kill law enforcement to make some extra money? BHunter doesn’t ask that question and doesn’t even consider it a possibility. Every mission needs to be completed to continue the game, no matter how out-of-character it is, and no one seems to notice the dissonance. After completing one of Mr. Luciano’s jobs to kill two police offers, you rack up over $100,000 in fines and get a bounty placed on your head. Immediately following this, the same police captain who branded you “BHunter scum” and called for your head assigns you another peacekeeping mission elsewhere in the city. Nobody seems to care that you’re playing both sides, to the point where crossing that mandated moral red line has little meaning. Not until halfway through the game do Luciano, the police, or the BHunters bring up your unscrupulous practices, then quickly dismiss them. The BHunter dispatcher tips you off to police malpractice, and even after the police set up an ambush so an underground gang can kill you, they continue to request your help. And of course, you accept. Everyone seems to have the memory of a goldfish, and it ruins any investment you might have in playing bounty hunter. BHunter clearly has room for a sly moral sensibility, as seen in a mission where the mayor has you assassinate a politician and acknowledges the public risk it exposes you to. But the game has no interest in applying that beyond a rudimentary, incoherent idea of a crime thriller. The roles of supporting players aren’t built well enough for the twists and turns amount to anything. The developers recognized the allure of a mercenary anti-hero who fights for and against a corrupt government, but the execution of that concept confuses your relationship with the city so deeply that your job doesn’t make sense anymore. For a game about interplay between factions, world-building can’t be an afterthought. The game reaches its potential when it can ignore the escalating stupidity of the story. Riding the City Ring between the Central Stadium and the Old Bronx is superb, mundane roleplay – watching the other cars glide through the poorly lit concrete tunnels, trying not to bang your head on the ceiling, and swinging around when a fugitive passes in the other lane. It’s both calming and empowering, like a rough-and-tumble future crime job should be. But even then, it only holds up in small bursts. The assignments are too similar, despite the occasional variance where you have to destroy an antennae or a suspicious shipping container. If you’ve played one chapter, you don’t need to play another. The game begs for a compelling narrative frame to hold long-term interest beyond jumping mission-to-mission. 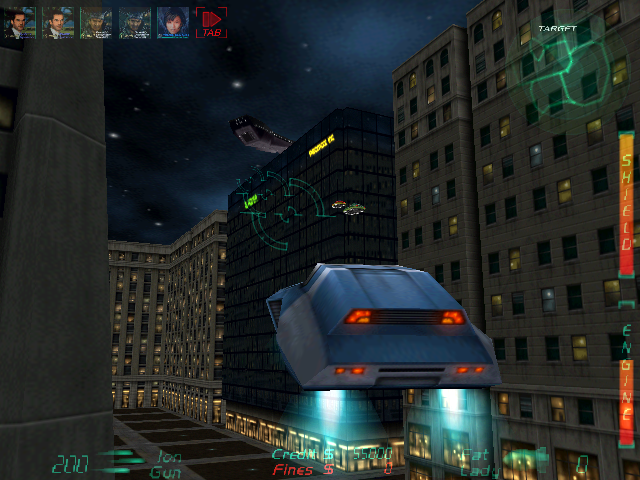 The flying car feels so great, and it lets you inhabit a convincing, unambitious cyberpunk setting. But if you’re to become an unprincipled bounty hunter in that world, BHunter needs to rework its narrative and spotty moral ambiguity. Imagine a version of the game with intelligible politics where your double-crosses matter and you get to chase gangsters through a mining facility. A ride as good as BHunter deserves both. BHunter has extreme difficulty running on basically every computer. 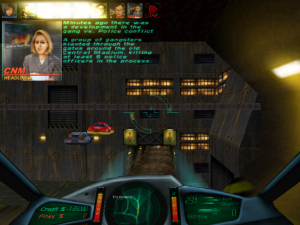 The game only works as intended on Windows 98; with anything else, it crashes immediately, sends back an error about playing the CD audio track, or freezes shortly after you shoot a suspect (that last one may be oversensitive copy protection). Virtual machines can’t take advantage of hardware acceleration, so the graphics look much poorer under those. An anonymous, uncredited person has modified the game to ignore the audio warnings and fix other compatibility problems. This version seems to run fine on Windows XP through Windows 10. For convenience, I’ve attached the new executable file here. This can replace BHUNTER.exe in an installed copy of the game. Do you know anything about Crime Cities? It’s an almost identical game from Poland that came out less than a year later. Both of them were on the heels of G-Police, another similar game by a European studio. 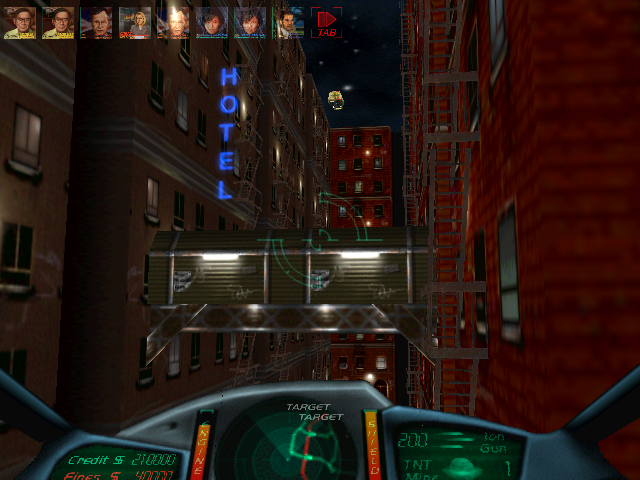 http://www.mobygames.com/game/g-police/screenshots I couldn’t guess why there was a late-90s wave of urban cyberpunk law enforcement hovercar shooters. Was The Fifth Element that popular? I used to love this game! Your article makes me remember why i never knew what the hell was going on with the storyline when I was playing it. It was fun blowing up all the other cars.. thanks for the nostalgia! Thank you for mentioning the issue about Win98 and cd music. I was getting no music under WinME and kept worrying my cd was bad but now I can finally have peace of mind. 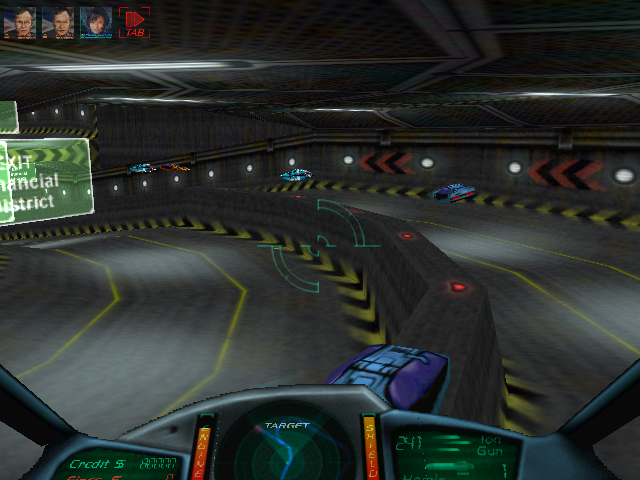 I’m currently playing through this with my sidewinder stick and Im having a great time.